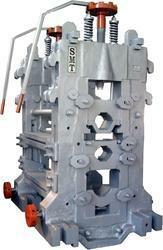 We are the prominent manufacturer and supplier of enhanced quality Hot Rolling Mill. The offered product is manufactured using supreme quality components and technically advanced tools in compliance with set market norms. The offered product is widely appreciated by customer as it gives smooth and trouble free performance. We are the leading manufacturer of Conventional Mill Stands and our product is made of good quality. In order to keep pace with the never ending demands of customers, we are involved into offering wide range of Rolling Mill Stand (Conventional Mill Stand).